Vegan Eats and Treats! : Jack O'Cuties, Skeleton Cookies & More! Jack O'Cuties, Skeleton Cookies & More! I'm not a crazed Halloween fan like some people, but I certainly can't resist the opportunity for festive food fun. I saw those little cutie tangerine pumpkins all over the place, but I didn't feel like peeling a load of tangerines. (or mandarins? I'm not actually sure)... So, I decided just to draw little Jack O' Lantern faces on my cuties! It was so fun. No two are the same! I took some to my yoga students, and I saved the other half to take to a Halloween party we're going to tonight. It's nice to provide some Halloween treats that are healthy. Also, this way if I feel like I'm being too tempted by sugary treats at the party, I can always make my way back to the big bowl of Jack O'Cuties. It was fun to let my students pick out their favorite - some people go for happy jack o'faces and some people like the mean, spooky faces! That said, I made cookies too! I used the Chocolate Roll-out Cookies recipe from Vegan Cookies Invade Your Cookie Jar. What took me so long to discover this recipe?? They were so delicious! I added a little extra cocoa powder and some chocolate extract for extra cocoa-power-punch. They taste like brownies! These cookies are my pride and joy this year, but I can't take credit - they were Mr. VE&T's idea. I have these yoga posture cookie cutters, and every year at Christmas I make Gingerbread Yogis for all my students. In years past, I've made Halloween Skeleton Cookies with my regular "gingerbread man" cookie cutter. But somehow, I never thought of making skeleton yogis! It was a fun icing challenge! I brought these (and a few jack o'cuties for the healthy-minded) to my yoga class on the night before Halloween. Needless to say - none of them made it home! 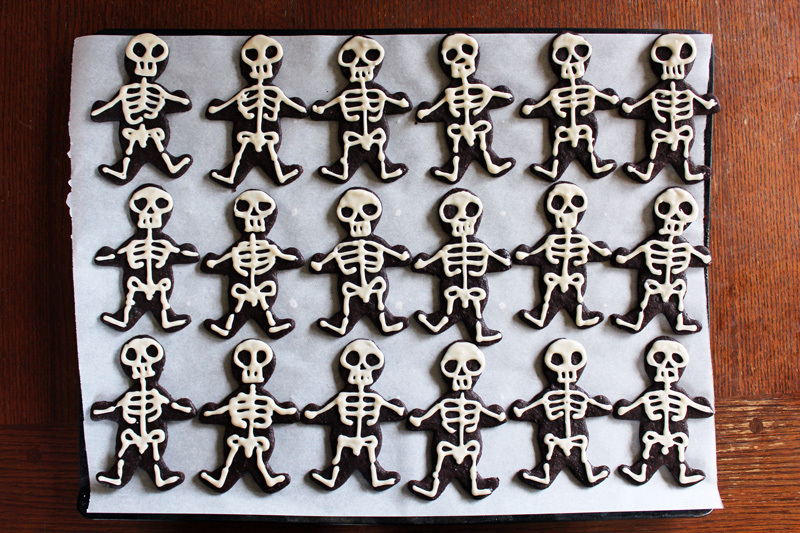 good ol' fashioned skeleton cookies! While I was at it, I figured I may as well make some proper spooky skeletons and bring them along to the Halloween party tonight. There were a couple that broke, so I took advantage of those "tragedies" to make sure the the cookies were delicious. Check! These cookies are full-sized Gingerbread men, maybe 5 inches high (? ), so they are actually pretty big. I like the ones where I left a nose hole better... the ones without noses look a little like Alien Skeleton Cookies - but I guess that's just as well for Halloween! 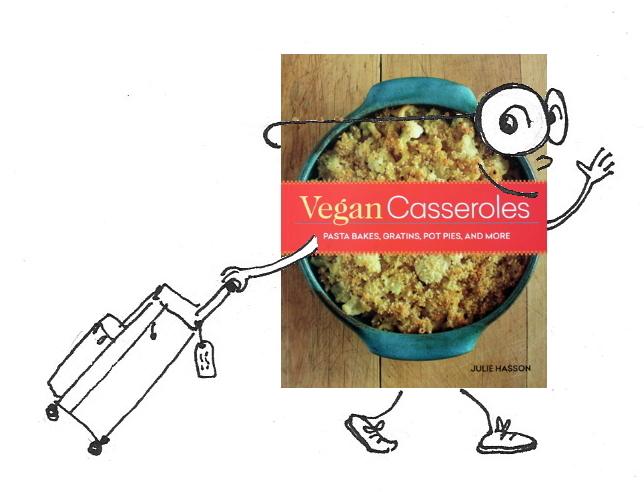 I promised to pick a winner for my "Vegan Casseroles" giveaway today... and with the help of the Random Number Generator, comment #23 was chosen. Congrats to Charj! O.M.G. LOVE the skeletons!!! A stunning success. Congratulations. 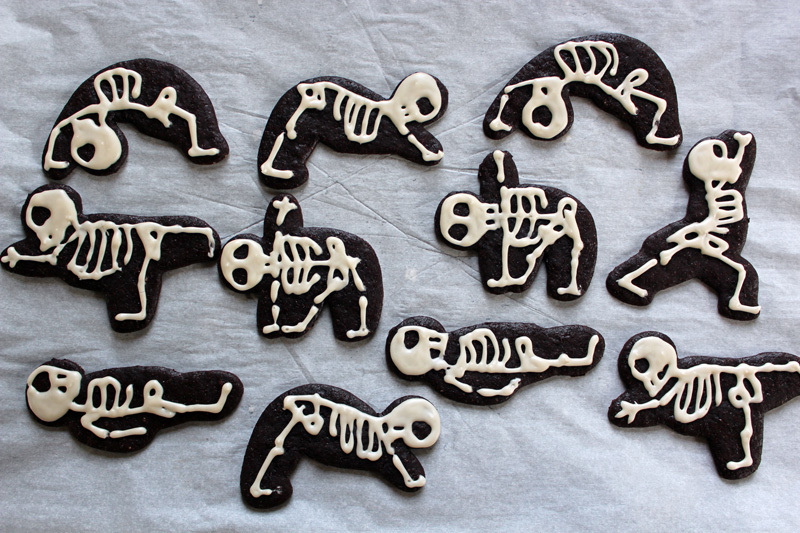 Oh, the yoga skeleton cookies are so much fun! What a great idea, Mr. VE&T! I have to say, though, it would take an artist to get it right with the skeleton profiles and body poses. Well done, Ms. VE&T! I love that you did all different faces for the jack o'lanterns. Super cute! I love love love the way your mind works and executes its creativity! Happy Halloween! Ahhh, I love the cookies AND the tangerines. Both so cute! The sceleton yoga cookies are the most awesome thing I have ever seen. More and more people over here celebrate halloween although we don't really have a tradition to do this and even though I think it's weird I just realised how great it is for kids. Since F is obsessed with skeletons right now I am pretty sure these are going to be made soon even though halloween is over. I am just not sure if I have your awesome piping skills. Love the skeletons doing yoga - what a cute line up! Next year, I'm totally prettying up my tangerines! I thought the jack o'cuties were one of the cutest things I had ever seen until I saw those skeleton yogi cookies! So cute!!! 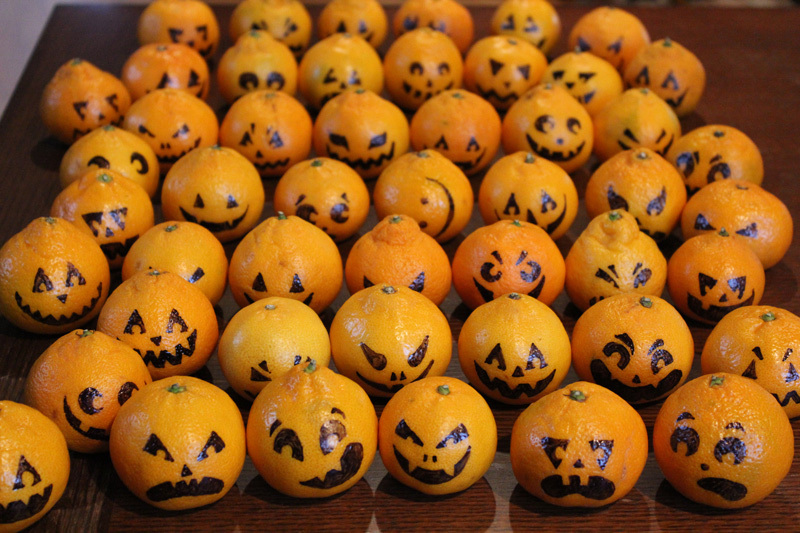 We gave away cuties for Halloween as a last-minute addition to our Halloween goodie bags. My husband wanted to make them into jack o'cuties, but there was no time!